Where "homely" and "luxury" meet. We Kindly Invite you to share with us the Spirit of the Cape Wine lands in Paarl. 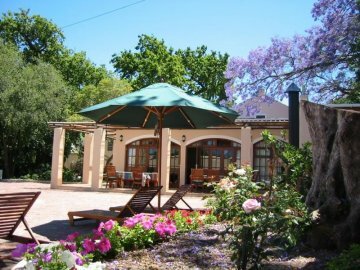 The family run Hotel offers great hospitality and a personal approach in a comfortable setting on a fruit and wine farm just outside of Paarl. Besides being a 4 star ****Hotel appointed by the South African Tourism Council, our visitors and guests rates us on TripAdvisor proudly ranking us in the top 4 hotels in Paarl. Join the happy reviewers in their enthusiasm and see for yourself what the travellers say about De Leeuwenhof Hotel. Offering Breathtaking views of the majestic Drakenstein Mountains and the Paarl Mountains with its massive Granite boulders, fantastic trips can be made to the various parks and nature reserves. You can further explore the Beauty that South Africa has to offer in the Western Cape by visiting the un-spoiled beaches, take scenic drives, enjoying the cosmopolitan shopping malls, endulge in some of the best fine dining restaurants, play a round of gold on the highly rated golf course and of-course one cannot miss out on visiting the famous Table Mountain. Our location is within a short distance to several romantic restaurants, , shops and of course beautiful wine tasting venues. We have recently opened our in-house seasonal restaurant so guests do not have to drive at night to find great food. Our chef will surprise you with fine dishes and of course we offer great house-wines to pair it all. Book with us and become part of the African Dream.